﻿ BinaryMate Review - Live Webcam Binary Option Trading - Scam or Legit? BinaryMate, the binary broker with one hour withdrawal processing time. 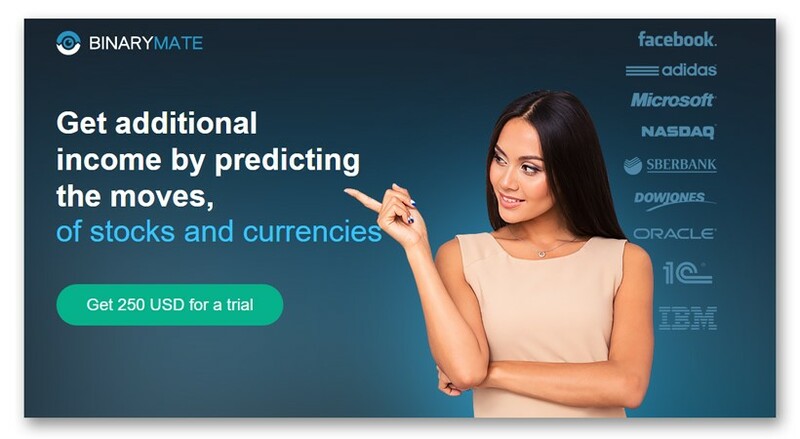 Although a recent entrant to the binary options trading industry, BinaryMate is already making waves among binary traders in the online trading community. This is because this binary options broker is said to have the shortest withdrawal processing time. On its website, BinaryMate claims a withdrawal time of one hour. In an industry where the average withdrawal time ranges from 3 business days to 7 days, this offer to process all withdrawal requests in just an hour has taken the binary options trading community by storm. If you are tired of your current broker who is taking ages to process your withdrawal requests, perhaps it is time to give BinaryMate a try. To find out what else BinaryMate have to offer, please check out our in-depth review of this broker below. If you are tired of your current broker who is taking ages to process your withdrawal requests, perhaps it is time to give BinaryMate a try. To find out what else BinaryMate have to offer, please check out our in-depth review of this broker below. BinaryMate is an online binary options trading platform that is managed by a company called Suomen Kerran LP. The management company is based in Edinburgh, Scotland and has its registered office at Centre Office, 58A Broughton Street, Edinburgh. Newly established, BinaryMate offers their clients online binary options trading services to more than 160 different types of financial instruments. In addition, they also offer a wide range of generous bonuses starting topping at a maximum of $100,000. And with their 24/7 support service manned by a team of multi-lingual customer support representatives, you can be assured of getting assistance whenever you need it. 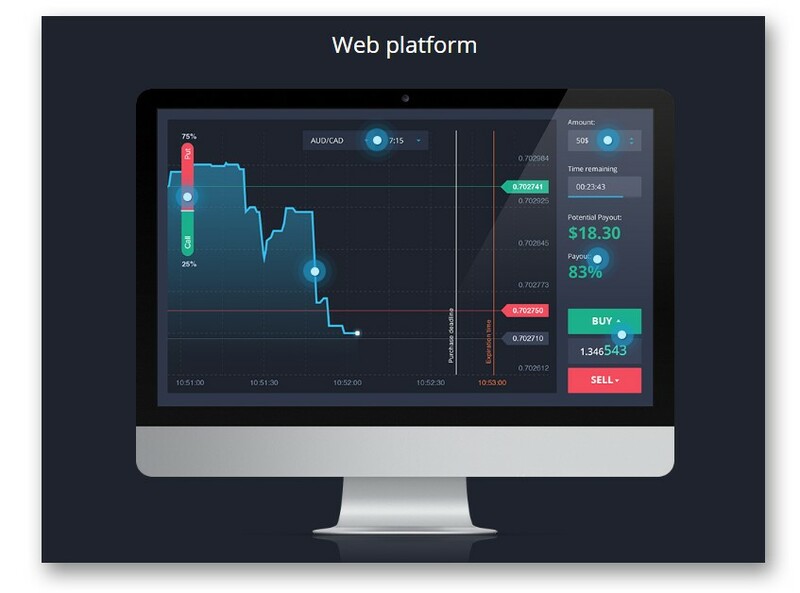 BinaryMate’s trading platform is web based and requires no software download or installation. The user interface is well designed and looks uncomplicated as well as slick. One of the main attractions of binary options is the fact that it is simple to understand and to trade with, a fact that is maintained with the way BinaryMate has designed their trading platform. The price chart is prominently displayed together with the expiry time ensuring that all the critical trade information are within sight. Once you have placed your trade, the price chart will be updated to show your position. Another plus point about BinaryMate’s trading platform is the fact that you can place multiple trades with the same chart. 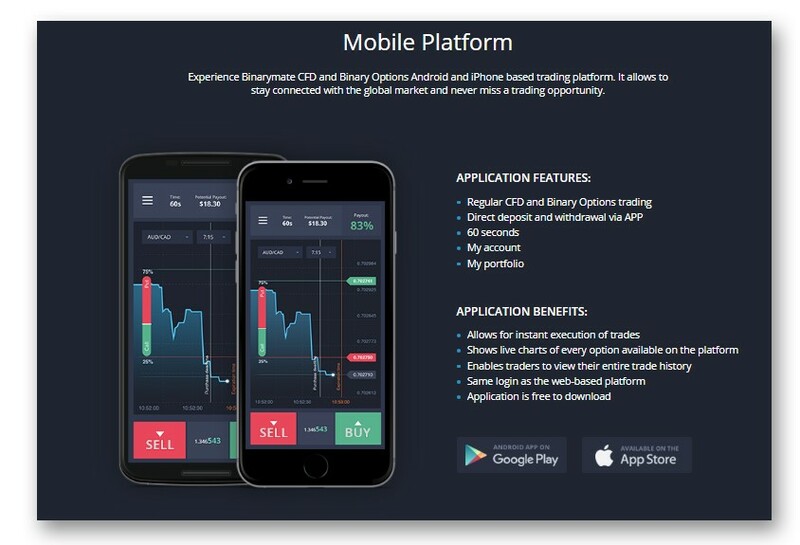 To cater for traders who wish to trade on the go without being desk bound, BinaryMate has also provided mobile optimized versions of their web based trading platform. Available for download at Google Play Store and Apple’s App Store, these mobile apps essentially have the same trading features as the web based version. For example, it has live charts for every instrument that is available for trading and the apps also allow traders to review their entire trading history on their smartphones. In terms of underlying assets which are available for trading at BinaryMate, there are more than 160 different types of instruments spread across 4 major asset classes; namely currencies, commodities, Equities and Indices. This is actually a pleasant surprise for us as it is rare for new binary options brokers to be able to support such a wide coverage of underlying assets. Nevertheless, the fact that BinaryMate has been able to do that shows that the broker is serious about building up its brand in the binary options industry. Equities: 3M, AIG, ALIBABA, ALPHABET Inc (Google), AMAZON, ANZ BANK, APPLE (US), AXIS BANK, BAIDU, BANCO SANTANDER, BANK OF AMERICA, BARCLAYS, BHP-AU, BLACKBERRY, BOEING, BP, BRITISH AMERICAN T, CARNIVAL CRUZE, CATERPILLAR, CITI (US), CK HUTCHISON, COCA COLA (US), COLGATE-PALMOLIVE, DISNEY, EBAY, EXXON MOBIL, FBP, FACEBOOK, FERRARI, GAZPROM (RUSSIA) GENERAL ELECTRIC, GENERAL MOTORS, GOLDMAN SACHS, GROUPON, HSBC HOLDINGS (LONDON), IBM, INTEL, JOHNSON & JOHNSON, JP MORGAN CHASE, LAS VEGAS SANDS, LLOYDS BANK, LUKOIL (RUSSIA), MASTERCARD, MAZDA MOTOR, McDONALD’S, MICRON, MICROSOFT (US), NETFLIX, NIKE (US), NISSAN MOTOR, PFIZER, RIO TINTO, RIO-AU, ROSNEFT’, S.BANK INDIA, SALESFORCE.COM, SBERBANK (RUSSIA), SINA, SONY, STARBUCKS, SUMITOMO MITSUI, TATA MOTORS (INDIA), TATA STEEL, TELEFONICA, TENCENT HOLDINGS, TESCO, TESLA MOTORS, TEVA PHARMA, TOSHIBA CORP, TOYOTA (US), TURKCELL (TURKEY), TWITTER, VODAFONE, VTB BANK, WAL-MART, WEIBO, WYNN RESORTS, YAHOO, YANDEX N.V. Currencies: AUD/CAD, AUD/CHF, AUD/JPY, AUD/NZD, AUD/USD, AUD/USD FUTURE, BitCoin/CNY, BitCOin/USD, CAD/JPY, EUR/AUD, EUR/CAD, EUR/CHF, EUR/GBP, EUR/JPY, EUR/JPY FUTURE, EUR/NZD, EUR/RUB, EUR/USD, EUR/USD FUTURE, GBP/CAD, GBP/CHF, GBP/JPY, GBP/RUB, GBP/USD, GBP/USD FUTURE, NZD/JPY, NZD/USD, USD/CAD, USD/CHF, USD/JPY, USD/JPY FUTURE, USD/RUB, USD/SGD, USD/TRY, USD/ZAR. Indices: ASX, ASX F-DEC16, BOMBAY SE, CAC, CSI 300, DAX (GERMANY), DOLLAR INDEX-DEC16, DOW (US), DUBAI, FAZ-SHORT BANKS(ETF), FTSE 100 (UK), FTSE 250, FTSE F-DEC16, FTSE MIB F-DEC16, GERMANY 10YR-DEC16, HANG SENG (HONG KONG), HANG SENG F-SEP16, IBEX, IBEX F-OCT16, ISE 30, KL FUTURE, KUWAIT, MICEX 10, MSM 30 (OMAN), NASDAQ (US), NIFTY F-SEP16, NIKKEI225（JPN), RTS, RUSSELL 2000, S&P 500 (US), SHANGHAI COMPOSITE, SMI, SSE180, TADAWUL, TEL AVIV 25, TOPIX, TSX 60.
Commodities: Coffee, Gold, Gold Future, Gold/EUR, Oil ( Light Sweet Crude), Oil Future, Platinum, Silver, Sugar. At BinaryMate, traders have 3 types of trading accounts to choose from, Bronze, Silver and Gold. As mentioned earlier, BinaryMate only takes up to an hour to process a withdrawal request. However, traders should bear in mind that it takes as long as 5 to 6 workings days before the entire withdrawal process is completed. BinaryMate does not charge any transfer fee for withdrawal except where it is done through wire transfer. If a withdrawal is done through wire transfer, there is $50 transfer fee. Take note there is a minimum withdrawal amount which is $50. However BinaryMate’s customer support goes one step further than what other binary options brokers have so far been able to provide. What sets BinaryMate’s customer support apart is the fact that they have advanced video assistance support integrated onto the binary broker platform. 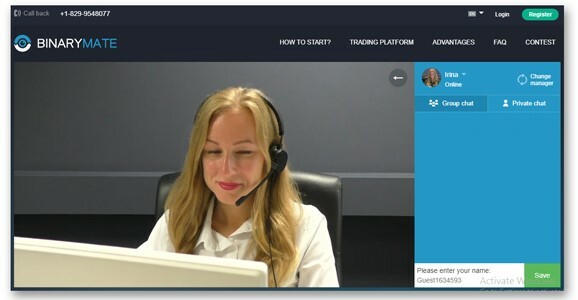 The video chat offers traders the ability to view who they are actually talking to on the live video support channel. In addition, the conversation can be broadcasted to a group under “group chat” or remain confidential under “Private chat” mode. In terms of extra features, BinaryMate does not seem to have any apart from the integrated live video support system. The platform also seems to be lacking an educational academy which beginner traders can access to improve their trading knowledge. Overall, we were quite impressed with what BinaryMate has to offer to traders. Despite the fact BinaryMate is a new broker, it has shown that it is capable of competing with other more established brokers in the industry. The fact that they are able to guarantee that a withdrawal request can be processed in under an hour is already impressive enough. With regards to their live video customer support, it is a first for the binary options trading industry. For the very first time, traders will be able to actually see who they are talking on the other end of the line. Regardless of whether you are beginner trader or an experienced trader looking for broker, we recommend that you give BinaryMate a try. What is “First 3 risk free trades”? With the First 3 risk trade bonus, you will be compensated with a trading bonus equivalent to what you lost for your first 3 trade loses. For further information, you can contact customer support. What are the payment methods supported by BinaryMate? The minimum deposit requirement is $/€250 while the maximum is $/€50000. All withdrawal requests at BinaryMate are typically processed within an hour. This is provided that all the verification documents are in order. How can I open an account at BinaryMate? To open an account at BinaryMate, simply to “Open Account” and fill in the registration form with all the required details. How do I close my account at BinaryMate? To close your trading account at BinaryMate, simply email your request to [email protected]. Once the account closure process has been completed, you will receive a confirmation email from BinaryMate. The information that I seek is not available in the FAQ. Should you require any further information, you can always contact customer support for assistance.